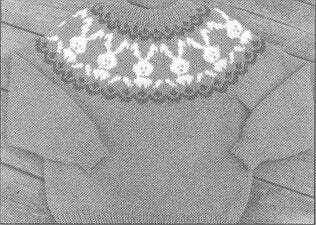 THE BUNNY FAIR ISLE #130 eweCanknit knitting pattenr for child's sizes 2-8. Chest measurements 2[22 ins] 4[25 1/2 in. ], 6[25 1/2 ins] 8[27 1/2 ins.]. Finished chest sizes; 26-28-30-32 inches.